Hotel DNA in the Digital Age – Can we evolve? While most traditional marketers, media gurus and public relations experts grapple with just how to leverage the power of digital media and social networks…real emerging trends sometimes go unnoticed. Sometimes all it takes is to tap into the world…and particularly the people around us to realize just how life as we know it is changing. I read this story from The Times with great interest (and would recommend it!) 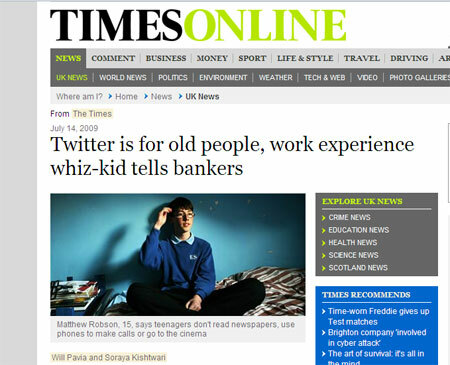 – “Twitter is for old people, work experience whiz-kid tells bankers” . While digital marketers are busy grappling with the opportunities and problems posed by the likes of Facebook and Twitter, it seems that the media consumers of the future are adopting new routes to interacting with each other. It boggles the mind to think just what we could learn by just talking to the Digital Native of today…not only is adoption of new tech & trends a lot quicker with those born into the digital age, but the perspectives refreshingly different…not to mention the low tolerance for digital failure. “FREE” is a word that most netizens take for granted… FREE is fast becoming the rule with online content…not the exception. Here’s another comforting thought…the teenagers of today are the customers of tomorrow. With change coming hard and fast, are we changing fast enough to keep up? And just what does all this mean for hotels? Perhaps the biggest challenge for us as an industry in the years ahead will not be how best to tweak our marketing campaigns or what gadgets to roll out…but our own image and how we perceive and understand our customers. The ‘Old Jeeves’ image has worked well for a long long time… but then again, the world just hasn’t changed as radically as it has in the past 2 decades. The message is clear…the most successful hotels and hotel marketers of tomorrow will be the ones who can break the mold and REALLY get to know their customers-t0-be and anticipate what they want…and that goes right down to Brand DNA and the personality of your business.